The first item of the day pertains to an exciting new website from the other side of the pond. Driving Route 66 is still in the formative stages of development but the professionalism, the passion, and enthusiasm displayed leaves little doubt this will be a site to follow. Meanwhile our companion site, Route 66 Info Center, continues to develop but at a more glacial pace. The latest edition is a section on ghost towns of Route 66. This takes us to the next book, Ghost Towns of Route 66. We (the publisher, Kerrick James, and I) are working to move the project towards the final edit stage. At this juncture cover design is the primary focus. I am still somewhat of a novice in the realm of professional photography and as a result was surprised to learn a few of our shots were being considered. Kerrick James is an artistic master and to have our work evaluated along side his is quite humbling and exciting. All of this ties in with the development of a sepia series of scenes from Route 66. I find these tones add a haunting quality to the fascinating relics that line the double six from Chicago to California. Color shots of some locations just don’t capture the essence, the feel of these empty places. 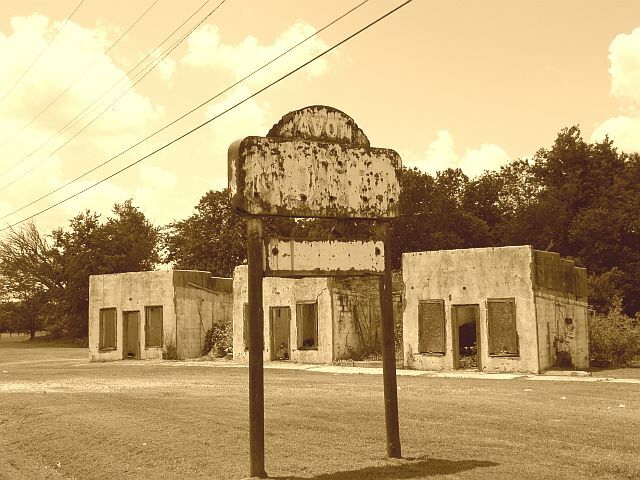 Consider these two photos of the Avon Motel in Afton, Oklahoma. These sepia toned photos are the latest in the development of a series of prints. The first was icons of Route 66 and the second was ghost towns of the southwest. This series will also be the largest and most ambitious project to date. This is quite fitting in light of the next writing endeavor, the penning of a Route 66 encyclopedia and atlas, the most challenging project yet undertaken as author. Meanwhile, the success of Saturday evenings Chillin’ on Beale Street has sparked a fever of enthusiasm, anticipation, and excitement about the July addition scheduled for July 17. As they become available details will be posted here as well as on the calendar of events on the companion site, Route 66 Info Center. The next item of interest is also Route 66 related. The Grand Canyon Caverns, east of Peach Springs, has introduced a lodging opportunity even more unique that the wigwams in Holbrook and Rialto, an open air motel room at the bottom of the cave! The final note of the day pertains to Jerry McClanahan, author of the ultimate travel guide to this legendary highway, EZ 66 Guide For Travelershttp://rcm.amazon.com/e/cm?t=1968adventurer&o=1&p=8&l=bpl&asins=0970995164&fc1=000000&IS2=1&lt1=_blank&m=amazon&lc1=0000FF&bc1=000000&bg1=FFFFFF&f=ifr. It would seem his efforts to preserve and promote Route 66 have been noticed as is this years winner of the prestigious Will Rogers award. Congratulations! I also live on Route 66, actually about a block off, in San Bernardino, CA, not far from the Wigwam in Rialto. I moved here a year ago and got interested in the Mother Road so started driving around, photographing and chronicling my finds and experiences in the immediate area. So much has been lost and digging it out has been a challenge, but a really fun one! So I'm rifling through your blog scanning the resources, and finding it extremely fun and informative. Thank you! Hopefully, after the summer heat, I'll make it to Arizona and expand my search for Route 66.